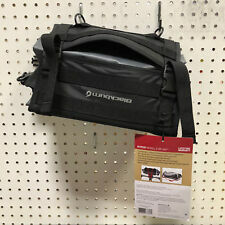 Blackburn under-bar tool bag with new Blackburn pump, tire kit, and tools. Multi-tool set. ALSO, New Hite-Rite seat adjuster ( no bag ). Low starting price, and no reserve! Never on a bike. Don't forget to look at. 6.95 liter largest bag in the line. Highly water resistant. Expandable bottom. Ditch the zip lock bags. This unique wallet protects your phone, MP3 player or small electronic device while allowing complete access to touch screen functions. waterproof pressure zip closure. Touch screen friendly. Highly water resistant. Durable high strength nylon. Condition is New. Every cyclist will want a VIP Strap Ride Wallet. Several pockets hold tools, patch kit, tire levers, money, I.D. and more. Water-repellent sleeve protects your I.D. and currency. Durable high strength nylon. Highly water resistant. This bag expands to accommodate both. Waterproof - The included welded stuff bag will keep all your critical gear dry. Works with many standard dry bags and stuff sacks. Daisy chain loop webbing provides extra opportunities to attach lights or other gear. Trending at $82.08eBay determines this price through a machine learned model of the product's sale prices within the last 90 days. 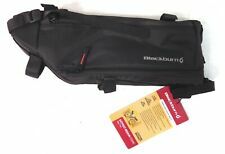 Blackburn Central Seat Bag - Rear Bike Bag - Saddle Bag - Velcro NEW 8" long. We serve as an outlet for the cycling and outdoor community to turn over their no longer needed gear. Reflective print for added visibility. We believe that no usable gear should be thrown out or neglected, it should be enjoyed by a new user. Model: Barrier City Waterproof Pannier. everything from bicycles and snowboards to jerseys and jackets. hassle free. Reflective Print. Roll Top Design. Clear Side Panel Pockets. Item Condition. Expandable bottom. Highly water resistant. Blackburn Central Shopper’s Pannier. Condition is New. Shipped with USPS Priority Mail. Brand new handlebar bag made by Blackburn. Awesome for bikepacking or bike touring. Water proof removable dry bag makes this a super versatile bag. A new Blackburn Local Small Seat Bag. This bag is made to fit under the rear of the seat. 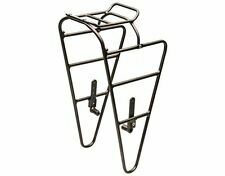 The Local mounts on any standard rear rack. The main body fabric is 210 denier polyester that's been treated, so it's abrasion- and water-resistant. Compatibility: standard racks, Blackburn Interlock system. Up for sale is one New Blackburn Local Light Rear Bike Pannier Light Rack Mount. Use to mount your Blackburn Local Tail Light to your rack. BLACKBURN BARRIER Universal Pannier. • Waterproof roll top design. • Front waterproof zipped exterior pocket. This pannier has a interlock system for easy connection on and off your bike rack. Hold capacity is 18 liters and weight is 630 grams. Blackburn EX Single Deluxe Pannier Dry Bag QR Black. Condition is New. Shipped with USPS Priority Mail. Spacious interior with adjustable organizer. Zippered I.D. and cash pocket. Color Black / Camo. Waterproof Water-resistant. Bag Material Deniers Nylon. Blackburn Barrier Bike Seat Bag Micro, Black and red, NEW 5" x 3" x 2". The BlackBurn Barrier bags are waterproof rolltop bags with an external pocket. Storable shoulder strap. Weather resistant fabric. Fleece lined exterior pocket for phone or glasses. For Sale: a light gray extra large rack trunk by Blackburn in almost new condition, used only once or twice. Plenty of room for stuff, and really stylish to boot. The walls are thick and stiff, almost insulated, so the usual sloppy drooping that most trunks suffer from is very unlikely with this one. • Expandable strap closure and mini pump sleeve. • Slim design for jersey pockets. Very nice gently used large Blackburn rear rack back. No rips, nor stains. Didn’t fit my rear rack. Plenty of storage space and the sides zip open for more space. (1) BLACKBURN EX SINGLE DELUXE QR PANNIER BLACK. - PICTURE SHOWS QR HARDWARE ON BACK, SNUGGLY FITS INTO ANY BLACKBURN RACK. - WATERPROOF ZIPPERED POCKET. - COLOR: BLACK / SILVER TRIM. Warranty varies by manufacturer. 11lb/5kg load capacity. Quick release mounting system. 7.5 Liter capacity. Versatile handlebar harness and waterproof stuff bag. Perfect for overnight rides and can easily carry sleeping bags, tents, clothing … nearly anything you need. Daisy chain loop webbing provides extra opportunities to attach lights or other gear. BLACKBURN LOCAL ORANGE/BROWN PANNIERS - ONE PAIR - LEFT AND RIGHT. When used with our Interlock racks, bags can be secured on the bike with a single key. Color: Orange. Shoulder strap included. Bought 3 for a trip I never took-brand new, never installed. Blackburn's Central saddle bag bike panniers have sizeable pockets and protective padding to keep your daily essentials organized and safe during your two-wheeled commute and beyond. Water-resistant polyester construction with stowable rain cover Panniers drape over real-wheel rack Zip main compartments include organizer sleeves Secures to INTERLOCK rack with key and lock Webbing carry handles and shoulder strap Fleece-lined zip pockets Reflective elements for low-light visibility Material: Polyester Capacity: 2745 cu.in. (39L) Dimensions: 17x11.5x17"
The Blackburn VIP Zip Ride Wallet gives you easy access to phone, MP3 player, money and other essentials. Water repellent and slim design for jersey pockets, the Blackburn VIP Zip Ride Wallet features a smart Phone/MP3 player pocket with clear cover, headphone port, 3 storage pockets, water repellent ID and currency sleeve, and 400 Denier fabric construction.